I had to ask myself upon reading this “how does a biblical worldview inform us that dinosaurs didn’t have feathers?” Why couldn’t they have feathers? Foley seems to just assume that the exclusive defining characteristic of a bird is having feathers and thus it would be impossible for a dinosaur to have them. Why? My bible does not define birds as synonymous with feathers. In fact my bible does not even define the flying things as synonymous with what scientists call birds since bats and pterodactyls also fly and they lack feathers. Why couldn’t God have made some dinosaurs with feathers? Even if most dinosaurs did not have feathers that would not preclude some dinosaurs from having them. Foley follows here definitive statement about feathered dinosaurs with “we may not know for sure what dinosaurs looked like” and yet her biblical worldview is somehow informing her that dinosaurs would not have had feathers? I’m very confused. Leaving aside the fact she has her facts wrong in this paragraph, the paragraph above contains a common argument found in the YEC literature which repeats a classic misconception of evolutionary biology. This argument is akin to claiming that evolutionists believe that because domestic dog bones are found in the same cave with those of wolves this is proof that domestic dogs could not have evolved from wolves. Or the more common manifestation of this argument can be found every day on Facebook with the statement – if man came from apes, why are there still apes around today? Foley’s use of this misconception, though, is especially egregious, and somewhat humorous, for two reasons. The first is that Answers in Genesis published her article apparently without realizing that she was propagating the same misconception that they claim they are aware is a fallacious argument. This suggests a lack of editorial oversight by someone in their organization. The second is that the Foley had written an article just five weeks earlier entitled “Creationists Misconceptions about Evolution” in which she specifically addressed the creationists’ misconception “if we evolved from apes, why are there still apes today?” So, five weeks later she pens an article for AiG in which she directly applies the very same fallacious argument she just warned creationists about using. Foley’s contradictions are ironic but not surprising. It is obvious that Foley did not actually understand the biological concept behind the misconception. She was simply reiterating statements that she had read in creationists literature. She only knew that this particular example was not true but didn’t understand why. So when she wrote about birds and dinosaurs she did not recognize that she was falling victim to the very same error. The creationists’ literature is replete with similar examples of contradictory statements. Why? Because most of these writers have very little scientific training, have never been involved in research and grew up reading inaccurate creationists literature and rarely been exposed to the original scientific literature. As a result, they frequently don’t understand biological concepts but have just memorized some facts some of which may not even be true or are outdated. Avery Foley describes herself as having a “Bachelor of Science in Religion from Liberty University and am working towards my Masters of Theological Studies from Liberty Baptist Theological Seminary.” Her lack of background knowledge and research of the subject she is writing about is very evident in her articles. It is unfortunate for the Christian community that this is what passes as creationists’ scholarship. Good blog. The reason creationists struggle so much with science is made apparent with the first of your quotes: “In a biblical worldview, we do not expect to find feathered dinosaurs”. They have mistaken a book of Bronze Age origin myths for a science text book. Thanks, though I prefer to say that the Bible simply wasn’t meant to answer the question of what a dinosaur would have looked like. The assumption that the article quoted above represents what creationists in general consider to be “a biblical worldview” is highly mistaken, as is the assumption that creationists in general struggle with science. There are as many biblical worldviews as there are creationists, and science is as much a matter of interpretation as is literature. Do you want to know how to throw yet another wrench in the creationist ideas? The Bible says that the bat is a kind of bird (Lev. 11:19) and all biologists agree that bats aren’t birds. That’s not entirely fair. What does it mean to categorize something as a “bird”? In modern English, our categories of animals mostly align with what biologists tell us about common descent (though not always – fish, bug, monkey, reptile, etc.). When I call something a bird, there’s an implication that it shares an ancestor with other birds. But this is after 150 years or so of science subtly reshaping our categories. Ancient Hebrew had a term that’s usually translated as “bird” that was applied to bats as well as birds. The speakers knew nothing of evolutionary science, so including something in that category wasn’t making a false claim about genetic relationships. Pre-scientific peoples classified animals based on general appearance and functional roles, not common descent. There’s nothing objectively wrong about having a word for winged vertebrates. The worst that can be said is that the word in Hebrew at that time was a polyphyletic term. I am glad they admit that feathered dinosaurs falsify the Bible. Now they will have to give it up. 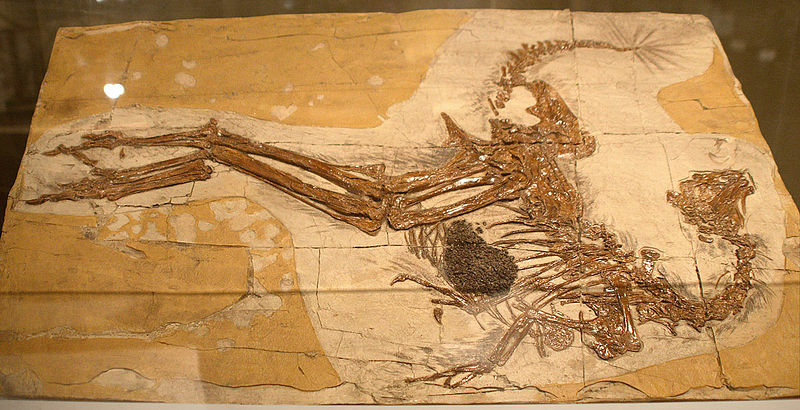 is it fair to think that dinosaurs are birds, and the birds we know today are a poor representation of what a bird is? Like if mammals, (as we know come in all shapes and sizes), faced a major extinction and only the bats had the privilege for survival? Wait a sec… Someone from AiG using the fossil record as proof of anything? I thought AiG’s – or at least AiG boss Ken Ham’s – stance on the fossil record was that it got all jumbled up in the Flood so it can’t prove anything? Why aren’t they falling back on the “historical science can’t prove anything” canard? The pattern of fossil record isn’t jumbled up – so YECs have difficulty showing scientifically that all or most of it can be accounted for by ‘Noah’s Flood’ rather than evolutionary change across deep time (though that does not stop them from trying).